Many manufacturers already have this kind of product but this one sets itself apart by its capacity to move a load up to 6.3 T by rolling and turning in every directions directly on the floor thanks to a button box or a remote control. Indeed, you do not need to modify your building by installing a rail or by drilling the floor. 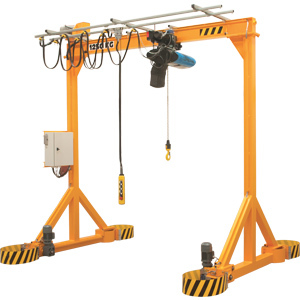 When an overhead crane is too expensive or simply impossible to install, this gantry crane provides you a reliable lifting solution. Available with a span up to 10 M and a height of 6 M as standard, the motorized gantry crane is also giving you the possibility to bring easily a heavy load from a workshop to another. The safety of use is ensured thanks to 4 bumpers. The gantry also has the possibility to turn on itself by reversing the direction of the motors and the collector connected to the power supply will allow the user to make 360 °. You can also choose the version on batteries with a remote control featuring progressive buttons to control the speeds. The batteries will power the motors of the wheels but also the trolley and the chain hoist, making this solution wireless and completely independent. The battery life will allow you to use it the whole day before charging it during the night on an outlet 230 V.